There is a number of reasons why people restore their phone. One of them might be, that you decide to reset your iPhone. Once your iPhone is reset all stored data, settings and apps are lost. For this reason is an imperative to back up your iPhone before you reset it. You can then restore your apps from iTunes. 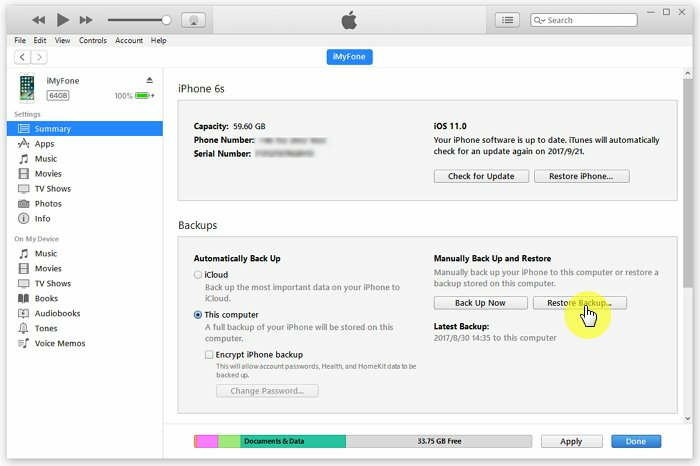 The drawback by restoring your iPhone using iTunes is that you only can restore certain elements, please refer to the listing below, yet, you cannot restore your home screen layout or any other settings. This means, after you restored your iPhone from iTunes, you have to go through all apps and restore your settings manually. If that seems too time consuming and bothersome, please keep on reading. There is a new software on the market, that will help you to restore iPhone from iTunes the way it was before you reset your phone. Step 1: Open iTunes on the Mac or PC that you used to back up your device. If there are new data on your iPhone, they will be overwritten. Sometimes the restoring process can be lengthy. Apps not bought through iTunes with in-app purchases will need to be restored, which, in some cases is not difficult or even impossible. iMyFone TunesMate is the number 1 software, which will solve all your restoring problems. Besides that iMyFone TunesMate is an intuitive software, easy and user-friendly. Transferring data between devices is straightforwardly done by importing and exporting them right where you want them. The best of all, you can transfer date from unlimited iTunes libraries to unlimited idevices. The advantage to iTunes is that you can choose which data you want to restore. That helps greatly if you want more space on your newly restored iPhone. You can transfer your iTunes library without a password. 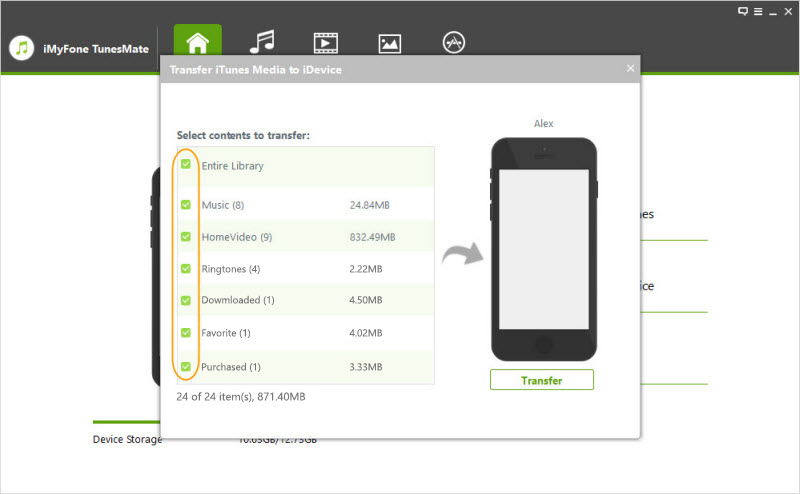 Between iOS devices and iTunes / PC, you have a convenient 2-way transfer. Both free and paid files are supported and transferred. Sync data without erasing old data. Step 1: Install and open iMyFone TunesMate. Connect your iPhone to PC. Step 2: Choose "Transfer iTunes Media to iDevices". Step 3: Select the contents you want and then click "Transfer". 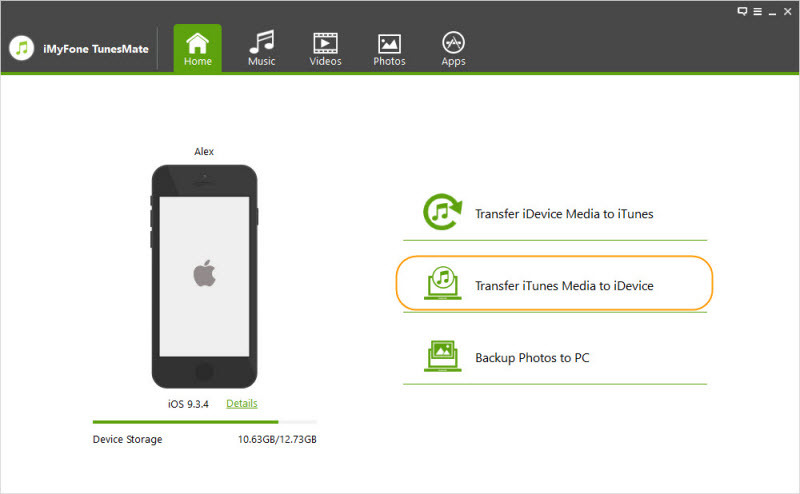 As you can see, restoring or transferring files from your iTunes to your iPhone is a simple, straightforward process. No long waiting, no syncing time. An easy, almost on the go process. Advantage: You can even rebuild your iTunes library, yes, in case it crashes, what it sometimes does. Even iTunes constantly updates and makes changes to its software, I still find it somewhat cumbersome and not particularly user-friendly. My main complaint, iTunes does not always do what it is supposed to do! iMyFone TunesMate is an alternative to conventional data transfer and takes the headache out of data restoring in your iPhone. For download iMyFone TunesMate, just click the button below.